The 2015 IEEE International Workshop on Advanced Robotics and its Social Impacts (ARSO 2015) will be held on July 1st – July 3rd, 2015 in Lyon, France. ARSO is a single track workshop, aiming to provide world class researchers, engineers, investors, economists, and representatives of industry and government with a forum to discuss cutting-edge robotics technologies, business opportunities, and other impacts on human society. Topics range from traditional Robotics technologies, innovation, socio-economic aspects, but also psychological and philosophical aspects of Human Robot Interaction. The workshop will be held in conjunction with the Robotics Exhibition INNOROBO 2015. 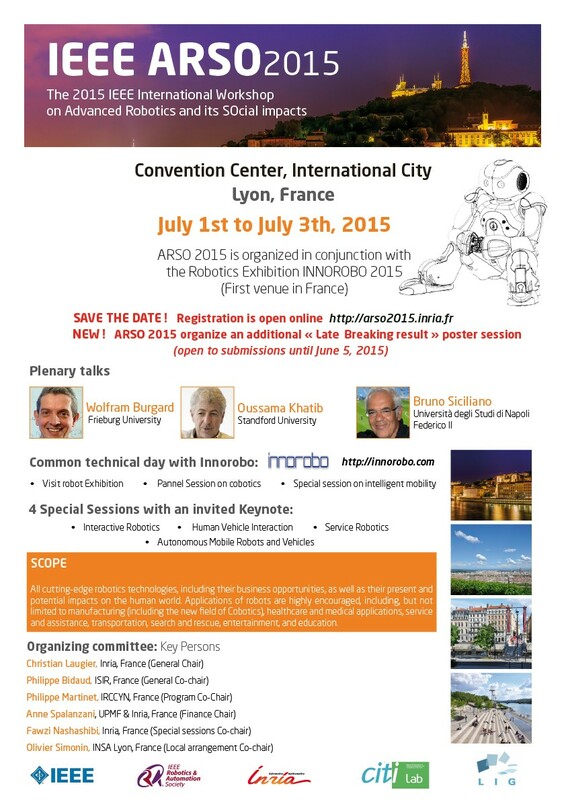 The technical program of ARSO 2015 will include a free one day visit of the exhibition and a half day technical session and a panel session shared by ARSO and INNOROBO. All cutting-edge robotics technologies, including their business opportunities, and present and potential impacts on the human world. Applications of robots are highly encouraged, including, but not limited to, in manufacturing (including the new field of Cobotics), healthcare and medical applications, service and assistance, transportation, search and rescue, entertainment, and education. Prospective authors should submit papers electronically in PDF format via PaperPlaza. Six pages in standard IEEE format are allowed for each paper. Up to two additional pages are permitted with an extra charge. Authors are encouraged to mention if they prefer an oral or an interactive presentation (including a 3mn teaser in the plenary session).